The Vitaceae are a family of dicotyledonous flowering plants, with 14 genera and ca 910 known species, including the grapevine and Virginia creeper. 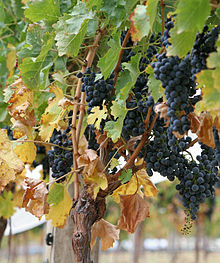 The family name is derived from the genus Vitis. The name sometimes appears as Vitidaceae, but Vitaceae is a conserved name and therefore has priority over both Vitidaceae and another name sometimes found in the older literature, Ampelidaceae. In the APG III system (2009) onwards, the family is placed in its own order, Vitales. Molecular phylogenetic studies place the Vitales as the most basal clade in the rosids. In the Cronquist system, the family was placed near the family Rhamnaceae in order Rhamnales. The family is economically important as the berries of Vitis species, commonly known as grapes, are an important fruit crop and, when fermented, produce wine. Leea, sometimes classified in its own family, Leeaceae, is included in Vitaceae by APG IV (2016) and the Angiosperm Phylogeny Website. Well preserved-fruits of Indovitis chitaleyae containing seeds with similar morphology to the Vitaceae have been recovered from Late Cretaceous Deccan Intertrappean beds of several sites in central India. These fruits and their dispersed seeds found in the same sediments, about 66 million years old, represent the oldest known fossils of the grape family. The fossil fruits containing 4 to 6 seeds are very similar to extant Vitis. ^ a b Angiosperm Phylogeny Group (2016). "An update of the Angiosperm Phylogeny Group classification for the orders and families of flowering plants: APG IV" (PDF). Botanical Journal of the Linnean Society. 181 (1): 1–20. doi:10.1111/boj.12385. ^ Manchester, Steven R.; Kapgate, Dashrath K.; Wen, Jun (September 2013). "Oldest fruits of the grape family (Vitaceae) from the Late Cretaceous Deccan cherts of India". Am. J. Bot. 100 (9): 1849–59. doi:10.3732/ajb.1300008. JSTOR 23596215. PMID 24036414. .
Jansen, R.K.; Kaittanis, C.; Lee, S.B. ; Saski, C.; Tomkins, J.; Alverson, A.J. ; Daniell, H. (April 2006). "Phylogenetic analyses of Vitis (Vitaceae) based on complete chloroplast genome sequences: effects of taxon sampling and phylogenetic methods on resolving relationships among rosids". BMC Evol. Biol. 6: 32. doi:10.1186/1471-2148-6-32. PMC 1479384. PMID 16603088.